Enjoy the open floor plan, with plush leather seating in the living room, complete with flat panel television. 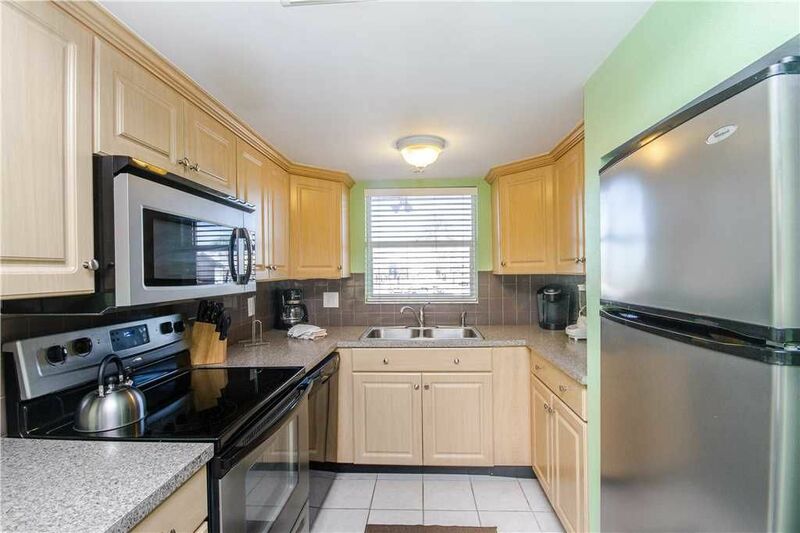 The updated full kitchen has new cabinets, and countertops, stainless steel appliances and bar seating. The master bedroom, with a king sized bed, is spacious and roomy. The second bedroom offers 2 twin beds providing both comfort and relaxation. Both bedrooms have televisions. Every need is met here for a wonderful vacation! The kitchen is fully stocked with utensils and fresh linens, extra pillows, plenty of towels and weekly maid service are provided. Of course, staying at Surf Song Resort means you are near it all! A short walk will find you at the some of the most gorgeous beaches Florida offers. Relax and take in the ocean air, or spend time by the pool. Better yet, do both! Whatever you choose, you won't be disappointed. Just across the street from John's Pass Village, a sought after destination for tourists and year round residents alike. The "Pass" is a quaint turn-of-the-century fishing village and has over one hundred unique shops, a variety of restaurants, the local fishing fleet, dolphin watching and shelling tours, boat rentals, parasailing and jet skiing. Best of all as a SunHost customer you can walk to this great entertainment destination. Anchor tenants include Bubba Gumps, Hooters and Hubbards Marina and also world famous Bamboo Beer Garden. Room was very nice.. but beds weren’t too comfy. But it all worked out.. we were there for the beach anyway! Great location and family friendly.. though the staff throwing left out toys and towels wasn’t very cool. Other than that...I’m sure we’ll be back! Our 2nd visit to Surf Song and we were very happy with our unit #230 . It's nicely furnished and has great storage. No view, but we enjoyed the common balcony on the 2nd floor. I did wish that there was a screen in the kitchen window though as that would give a nice cross breeze through the living area. Common areas are well maintained and the pool warmed to the perfect temperature. The weekly cleaning is a great bonus. We have stayed at a few other places in Madeira & Treasure Island but this is best value if you want to be right on the beach !